This book offers comprehensive, state-of-the-art information about time-domain fiber-optic testing. 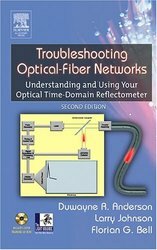 Readers will gain an understanding of how to troubleshoot optical-fiber networks using an optical time-domain reflectometer (OTDR), while learning the fundamental principles underlying the operation of these powerful testing instruments. From basic fiber optics and fiber testing, to detailed event-analysis techniques, this book covers the entire spectrum of time-domain optical cable test theory and applications. Early Development, Fundamentals of Fiber Optics, Fundamentals of OTDR Operation, Performance Characteristics of OTDRs, Measuring Non-Reflective Events, Loss-Measurement Error, Measuring Reflective Events, Complications Caused by Reflective Events, Measuring the Numerical Aperture and Cut-Off Wavelength of Single-Mode Fiber, Using OTDRs to Analyze Passive Networks that Include Couplers, Automatic-Event Marking Algorithms and Calibration, Test Fixtures, Polarization Mode Dispersion, Dispersion in Optical Fibers, Considerations in Purchasing your OTDR.